Currently available from the Market as a free tech preview, the application utilizes the PCoIP protocol so that you can control your computer effectively whether you're on a fast WiFi network or a slower 3G connection, as it adapts the quality of the connection depending on how much bandwidth you have available. Of course, you are bound to get a better experience from a 20Mb/s home broadband connection than you are on a 2Mb/s 3G connection on the move, but you should be able to see enough detail on your display as long as you have a few bars. The Honeycomb keyboard has been tweaked slightly to offer additional function keys which are needed for Windows. On top of the standard keyboard is an extra toolbar, which allows you to access PC specific buttons such as 'Ctrl', 'Shift' and the Windows key. As you can bring up the keyboard at any time by tapping with three fingers, it provides access to these functions across the system, which is always handy in the event that a program crashes and you need to do a quick Ctrl-Alt-Delete job. If you don't need a full keyboard, but want to quickly access some function buttons or the arrow keys, then you can bring up a small, floating control pad instead. This can be moved anywhere on the screen so that it doesn't block out any of the content that you may be working on, and it's also slightly transparent so that you can see some of the content behind it. If you want to directly control the cursor on the display instead of tapping your way to a destination, you can bring up the 'TouchPad' from within the application. This emulates a trackpad like you would find on a standard laptop, with two buttons at the bottom for left and right clicking. To avoid the TouchPad interfering with the content on the screen, it is set to be slightly transparent like the floating control pad, so that you can see through it if a window is placed underneath. You can also drag it around the screen and place it wherever you like, depending on what application you currently have open, which is a nice addition. Using Windows on a touch screen without the ability to fall back on a mouse and physical keyboard could be a fairly painful experience without gestures, so there are some key tapping and advanced gestures which have been built into the application. Clicking is accomplished through tapping with one finger, and for a secondary click you can take two fingers and tap with them at the same time. 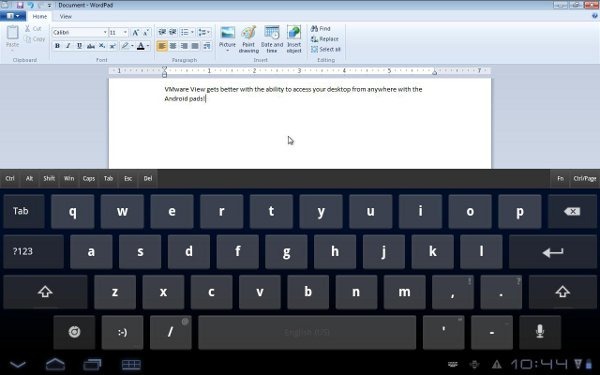 Dragging an item on Windows is done in a similar manner to how you would do it on Android. You can tap and hold an item until you feel some haptic feedback from the device you're using, at which point you can then drag the item you have selected. If you need to bring up the keyboard on the screen at any time, you can do so by using three fingers and tapping on the area where you want to type. Using the same three finger tap will also take the keyboard away. To scroll a document or a web page, you can use two fingers, and scroll in the same direction as you would in Android, i.e. move your finger up the screen to scroll downwards. If you need to dive back into the Android world, you can do so whilst leaving your VMWare session running in the background, so that you can quickly get back to it without having to start up all over again. As the application will be maintaining a connection in the background, however, this might have a bit of an adverse effect on battery life, so you may not want to leave it in the background and forget about it for a few hours afterwards! Considering that the application is just a tech preview right now, it looks really impressive. Navigation looks slick, the gesture support is a great feature to have and it weighs in at under 5MB too, so you won't have to worry about it taking up too much space on your tablet. It's currently available to download for free, so check it out in the Market!